Astronomers have gleaned some of the best data yet on the composition of a planet known as HR 8799c—a young giant gas planet about 7 times the mass of Jupiter that orbits its star every 200 years. The team used state-of-the art instrumentation at the W. M. Keck Observatory on Maunakea, Hawaii to confirm the existence of water in the planet's atmosphere, as well as a lack of methane. While other researchers had previously made similar measurements of this planet, these new, more robust data demonstrate the power of combining high-resolution spectroscopy with a technique known as adaptive optics, which corrects for the blurring effect of Earth's atmosphere. "This type of technology is exactly what we want to use in the future to look for signs of life on an Earth-like planet. We aren't there yet but we are marching ahead," says Dimitri Mawet, an associate professor of astronomy at Caltech and a research scientist at JPL, which Caltech manages for NASA. Mawet is co-author of a new paper on the findings published today in the Astronomical Journal. The lead author is Ji Wang, formerly a postdoctoral scholar at Caltech and now an assistant professor at Ohio State University. Taking pictures of planets that orbit other stars—exoplanets—is a formidable task. Light from the host stars far outshines the planets, making them difficult to see. More than a dozen exoplanets have been directly imaged so far, including HR 8799c and three of its planetary companions. In fact, HR 8799 is the only multiple-planet system to have its picture taken. 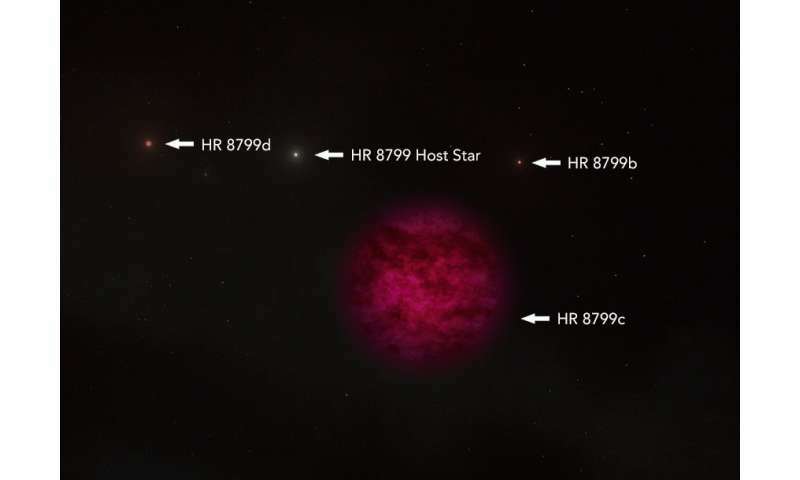 Discovered using adaptive optics on the Keck II telescope, the direct images of HR8799 are the first-ever of a planetary system orbiting a star other than our sun. Once an image is obtained, astronomers can use instruments, called spectrometers, to break apart the planet's light, like a prism turning sunlight into a rainbow, thereby revealing the fingerprints of chemicals. So far, this strategy has been used to learn about the atmospheres of several giant exoplanets. The next step is to do the same thing only for smaller planets that are closer to their stars (the closer a planet is to its star and the smaller its size, the harder is it to see). The ultimate goal is to look for chemicals in the atmospheres of Earth-like planets that orbit in the star's "habitable zone"—including any biosignatures that might indicate life, such as water, oxygen, and methane. Mawet's group hopes to do just this with an instrument on the upcoming Thirty Meter Telescope, a giant telescope being planned for the late 2020s by several national and international partners, including Caltech. But for now, the scientists are perfecting their technique using Keck Observatory —and, in the process, learning about the compositions and dynamics of giant planets. "Right now, with Keck, we can already learn about the physics and dynamics of these giant exotic planets, which are nothing like our own solar system planets," says Wang. In the new study, the researchers used an instrument on the Keck II telescope called NIRSPEC (near-infrared cryogenic echelle spectrograph), a high-resolution spectrometer that works in infrared light. They coupled the instrument with Keck Observatory's powerful adaptive optics, a method for creating crisper pictures using a guide star in the sky as a means to measure and correct the blurring turbulence of Earth's atmosphere. This is the first time the technique has been demonstrated on directly imaged planets using what's known as the L-band, a type of infrared light with a wavelength of around 3.5 micrometers, and a region of the spectrum with many detailed chemical fingerprints. "The L-band has gone largely overlooked before because the sky is brighter at this wavelength," says Mawet. "If you were an alien with eyes tuned to the L-band, you'd see an extremely bright sky. It's hard to see exoplanets through this veil." The researchers say that the addition of adaptive optics made the L-band more accessible for the study of the planet HR 8799c. In their study, they made the most precise measurements yet of the atmospheric constituents of the planet, confirming it has water and lacks methane as previously thought. "We are now more certain about the lack of methane in this planet," says Wang. "This may be due to mixing in the planet's atmosphere. The methane, which we would expect to be there on the surface, could be diluted if the process of convection is bringing up deeper layers of the planet that don't have methane." The L-band is also good for making measurements of a planet's carbon-to-oxygen ratio—a tracer of where and how a planet forms. Planets form out of swirling disks of material around stars, specifically from a mix of hydrogen, oxygen, and carbon-rich molecules, such as water, carbon monoxide, and methane. These molecules freeze out of the planet-forming disks at different distances from the star—at boundaries called snowlines. By measuring a planet's carbon-to-oxygen ratio, astronomers can thus learn about its origins. Mawet's team is now gearing up to turn on their newest instrument at Keck Observatory, called the Keck Planet Imager and Characterizer (KPIC). It will also use adaptive optics-aided high-resolution spectroscopy but can see planets that are fainter than HR 8799c and closer to their stars. "KPIC is a springboard to our future Thirty Meter Telescope instrument," says Mawet. "For now, we are learning a great deal about the myriad ways in which planets in our universe form." Nice result - confirming water spectroscopically from HR 8799 c. I wonder if they will look at the other three planets. For some reason the artist's impression did not include HR 8799 e.
Well done to the research team. I hope they perfect their technique in the very near future. 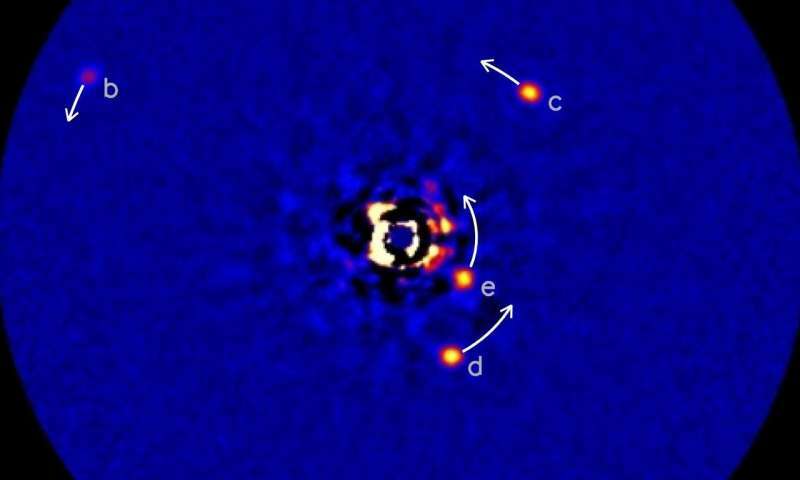 It'll be exciting to finally get a glimpse of these exoplanets in some electronic image. As to the artists impression - why didn't they just post the image they got so far?